It is believed that the ancient, mysterious and hauntingly beautiful site of Petra in Jordan has been inhabited (in one way or another) for approximately 9000 years although its existence was kept secret from the modern West until 1812, when Swiss explorer Johann Ludwig Burckhardt “rediscovered it” and revealed its magnificence to the world. Petra – Jordan was designated a World Heritage Site in 1985 and it has been described as “One of the most precious cultural properties of man’s cultural heritage”, by UNESCO. In Arab tradition, Petra is the place where Moses struck a rock with his staff and water came forth, and where his sister, Miriam, is buried. The word Petra (as with Peter) means “rock” and is derived from the Greek and Arabic language. It is a wonderfully appropriate name as this ancient city is literally carved from the rose-red sandstone hills and outcrops. Although Petra in jordan is most commonly associated with the Nabataeans, it has been occupied by many different tribes and nations over the millennia. The true mystery of Petra (the lost city) is just how little is known about its history although this is likely to change as each year new studies and excavations slowly reveal the secrets of the place. Evidence of Neolithic habitation of jordan and Petra in the form of six ascending rows of dwellings has been discovered near Baida and suggests that it may be one of the oldest recorded known sites of human habitation in the world. 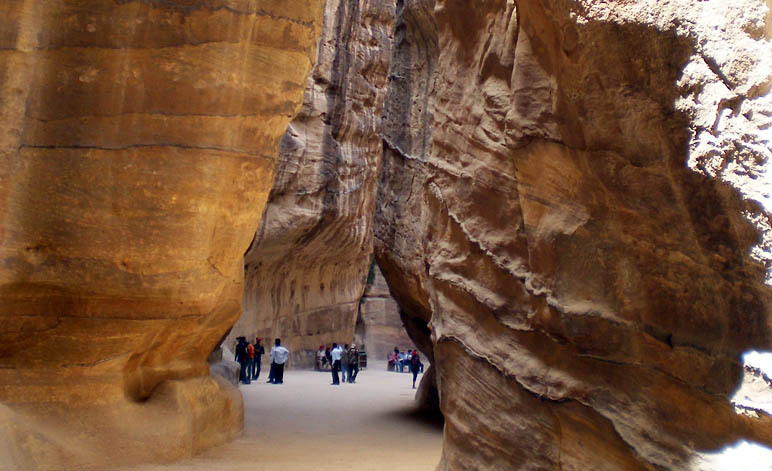 It has proven impossible to accurately identify when the history of Petra began in Jordan. Tradition has it that the first recorded people to live in the area were the cave-dwelling Horites. 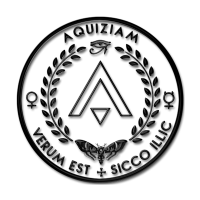 It is believed that the Edomites settled in the region during the first millennium B.C. There is a reference in the Bible that they were one of the nations that refused to permit the wandering Jews lead by Moses to enter their lands. The Edomites undertook a complete and systematic takeover of the region (Jordan) and established a stronghold that included the plains of the Umm al Biyarah plateau. The archeological remains of many dwellings that date from the 7th century B.C. have been found in the area. In addition, the remains of cisterns for the collection of rain water dating from this time indicate that the occupants were already experimenting with the water management systems that were to become so important to the success of Petra, the city, in the future centuries. The nation of Edom is known to have existed back to the 8th or 9th century BC. The Old Testament dates it back several centuries further. Recent archaeological evidence may indicate an Edomite nation existed as long ago as the 11th century BC, but the topic remains controversial. During the 4th century B.C. 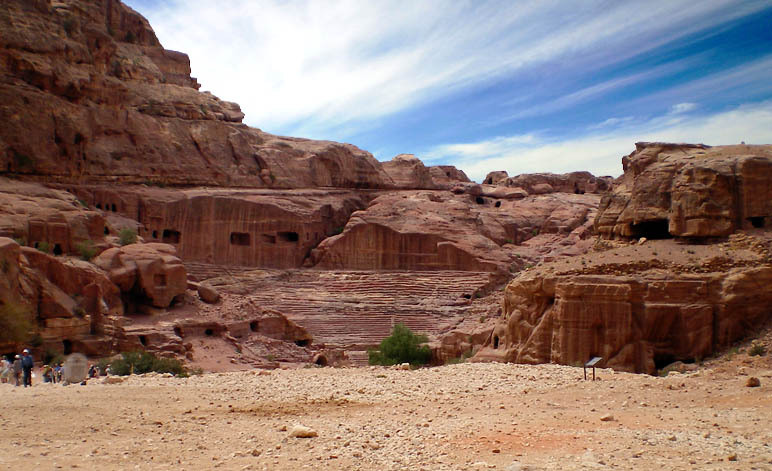 a new nation emerged in the region – The Nabataeans. Little is known about the origin of these people but it is believed that they were part of a migration from the south of the Arabian Peninsula. This group progressively took control of what is today southern Jordan and established a sophisticated trading network with Petra as their Capital City. As their power grew, the Nabataeans quickly gained control of the trade routes from the Red Sea to the coast of the Mediterranean. No one is precisely sure what goods were being moved but it is likely to have been incense, myrrh, spices, gold and copper as well as precious stones and even some slaves. It is recorded that in 312 B.C. the ruler of Syria, Antigonus I Monophthalmus (“the One-eyed”), who had succeeded Alexander the Great, initiated two great attacks on Petra. The first was led by Atheneus and the second by his own son Demetrius. Both military campaigns failed. 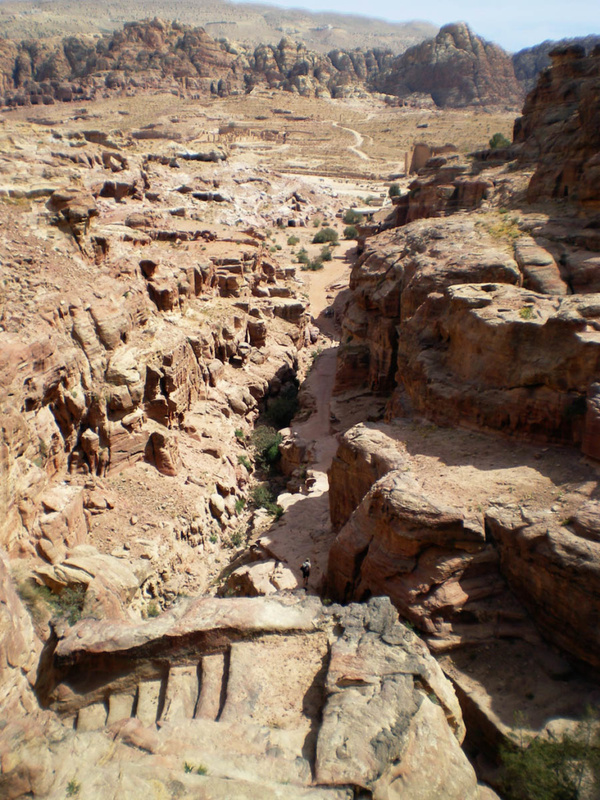 The almost impregnable rocky defenses of Petra and the determination of the Nabataeans won the day. At the height of their power not only did Petra possessed the advantages of a natural fortress but controlled the main commercial routes which passed through it to Gaza in the west, to Bosra and Damascus in the north, to Aqaba and Leuce-Come on the Red Sea, and across the desert to the Persian Gulf. Unfortunately, not a great deal is known about the Nabataeans of Jordan although there are references and hints to be found in the history texts. The first mentions a Nabataean King Harith or Aretas and dates from the third century B.C. and refers to the sanctuary that he provided for the High Priest Jason of Jerusalem when Antiochus confirmed Menelaus, the brother of Simon the Benjaminite in his place and thus forced Jason into exile. A more accurate timeline of the Nabataean kings can be established from 100B.C. onwards based on the appearance of more written references. The Roman general, Pompey, appears to have conquered the Nabataeans in 64 – 63 BCE. Fortunately for Petra he believed that there were benefits to keeping an independent Nabataea that could operate as a buffer zone against the desert tribes. The power and prestige of the Nabataean kingdom in now modern Jordan reached its peak during the rule of Harith III Philodermus (84-56 BC) and Harith IV (9bc – 40A.D), Malik II (40-71 AD) and Rabbel (71-106 AD). Still, even as the Petra City expanded the first signs that independent Nabataean rule was under threat were emerging. From the North the influence of the Roman Empire was growing more powerful. In the South new trade routes were being discovered and developed that would bypass Petra and even Jordan. Some historians and environmental experts believe that this was also a period of noticeable climate change. Petra had always been relatively dry and had developed a sophisticated system of aqueducts and water storage cisterns both to provide water and to protect the city from flash-flooding but now things were changing. At a time when the successful city demanded more water – there was less rain. The city of Petra had always depended on importing food but with the decline in trade it needed to find ways to provide its own. This theory is supported by evidence of intense agricultural efforts by the Nabataeans which can still be seen in Southern Jordan and the Negev. In this climate of change, the Nabataean kingdom still managed to resist the final absorption of their nation into the Roman empire and survive the growing economic hardships. The ‘Amphitheatre of Petra’ in Jordan. With the death of Rabel II in 106, the power of the Nabataeans became precarious. The Roman Emperor Trajan (Marcus Ulpius Nerva Traianus) already famous for his military success in conquering the Dacia nation ruled by King Decebalus in 106 A.D. pushed further east and finally conquered Nabatea in 107 A.D. Trajan ordered the governor of Syria, Cornelius Palma, to make Nabatea (Jordan) into a Roman province with the capital at Bosra. For the Nabataeans it was the end of their power and they began to decline as a nation although life for the average citizen probably went on as normal. The short-lived province of Arabia Petraea was formed and although Petra was no longer the capital of the region it appears to have continued to grow and do well under its new rulers and was even awarded the title of metropolis or mother-city. Even if it lacked true power, Petra still wielded tremendous influence in the region. For example, when Emperor Hadrian visited it in 130 A.D. he was so impressed with its magnificence and aura of mystery that he renamed it Hadriana Petra (Sometimes now referred to as Adriana Petra. Even as the Nabataeans declined the city experienced an influx of new people from Roman, Greek, Arabic and Semitic origin. This mixing of cultures must have made Petra a remarkable and lively place and is perhaps the reason why it continued to flourish for some time to come. It is during this period that many of the great monuments were constructed. However, Roman rule of the region was under constant threat and during the rule of Emperor Alexander Severus (222 – 235 A.D.) Just when the city of Petra was at the peak of its new power the first major disaster appears to have struck Jordan. Many historians attribute this to an invasion by the neo-Persian Sassanid Empire. Coinage stopped being minted and there is suddenly no more new and sumptuous tombs being built. The final decline of Petra had begun. One can only imagine and speculate what it must have been like as year-on-year fewer traders came to Petra as the city of Palmyra drew away the Arabian merchants. As time passed the city would have perhaps taken on a rundown appearance. A person can just imagine the remaining civic leaders talking over their food and debating when they too should leave. 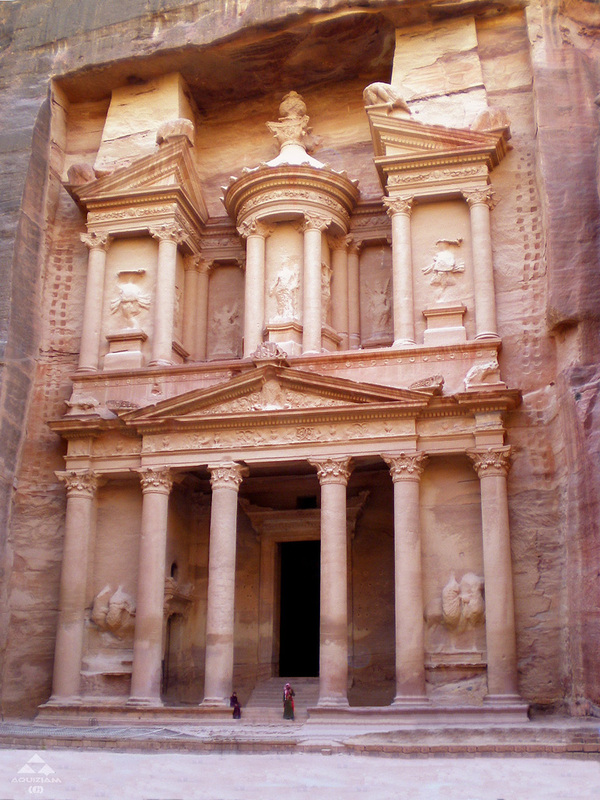 Records show that Petra in Jordan did continue to be a successful city and a centre of religion. Christianity had certainly well established itself in Petra by the 4th century A.D. – 500 years after the Petra had become an important trade center. Athanasius of Alexandria (293 – 373 A.D.) mentions a bishop of Petra named Asterius. At least one of the rock tombs (The Tomb of the Urn) was used as a church. The royal tombs of Petra taken from the South Temple. A second and more damaging disaster seems to have struck the rock city in the form of a series of powerful earthquakes. The city had already had a history of tectonic spasms as it sits near the boundary of the Arabian plate but this quake was significantly more damaging than those that had come before. The date of this event is said to be May 19, AD 363 A.D. and is based coins found in the ruins and the testimony of Cyril, Bishop of Jerusalem in a letter he wrote. According to the Bishop more than half of Petra (Reqem) was destroyed including Qasr Al Bint (House of the Daughter), The Colonnaded Street, The South Temple and the rock Amphitheatre. Much more dangerous to the remaining citizens of Petra was the damage that the quake did to water system of the city. Had the quake occurred earlier in the history of Petra the city may have rebounded fully but the slow decline of the past century and the loss of its status as a trading centre had broken the will of the people to completely rebuild their rock fortress. There are claims that “large Christian Churches carved from the rock ” were still being built and used during the early Byzantine era in Petra as late as 450 A.D. but although this comes from a reputable source the datelines don’t quite match up. What appears to have happened is that further Earthquakes repeatedly struck the city and the region; each one causing successive damage. It is believed that an Earthquake more devastating that the one that wrecked the city in 363 AD struck in the year 551 AD. By all accounts it ruined the rock cut city and further damaged the partially repaired water management systems. A person can only speculate what happened next. Did the remaining citizens quietly gather their belongings and, as a column of refugees, depart together for other cities or did they drift away over the years as it became obvious that without the water system and significant trade the city of rock was finally finished. Most scholars believe that the power of the Byzantine Empire appears to have shielded the area from Muslim expansionism for some time but during 629 – 632 A.D. the Islamic conquest of the region (now Jordan) appears to have swept away the last vestiges of Christianity in Petra. Records and references to Petra become increasingly scarce and it is accepted that by 700 A.D. the city of rock that had once housed 20,000 people was deserted except for the Bedouin and the flocks they tended. Finally it seems that history forgot Petra. The ruins of the city (and the region of Jordan) were briefly occupied during the First Crusade by Baldwin I of the Kingdom of Jerusalem and remained in the control of the Franks until 1189 A.D. – who called it the Moyse Valley. (Château de la Valée de Moyse or Sela). However the Crusaders true seat of power in the area was the magnificent Castle of Montreal (Mount Royal) or “Shobak” as it is known today, some 16 miles from Petra. Petra appears again in History during the late 13th century when the ruins of the Rock City became a place of curiosity during the Middle Ages and were visited by the Sultan Baibars (Baybars) of Egypt. 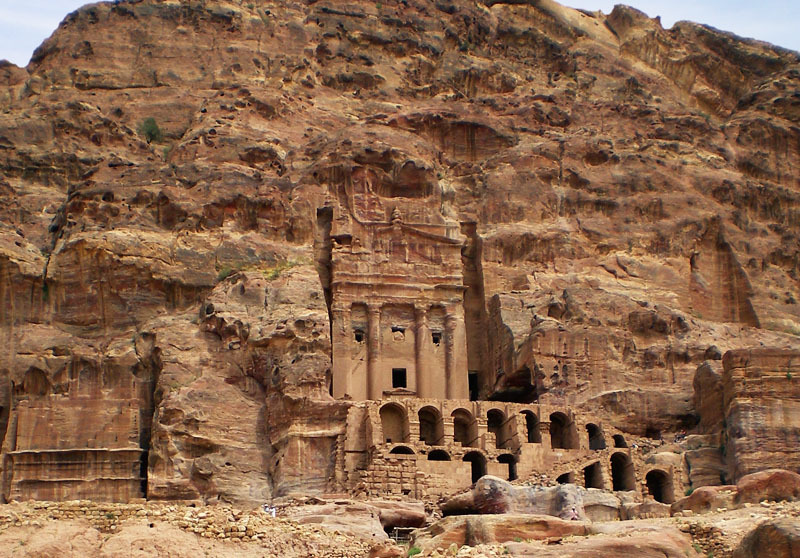 For the following 600 years Petra becomes a forgotten City. No doubt people new of its existence and according to Bedouin tradition it remained occupied by nomadic desert people and occasionally visited by Islamic explorers and travelers. However, as far as Europe was concerned – it had slipped from memory to become no more than another legendary place in a mysterious world. Petra in Jordan was once again brought to the attention of the West by an explorer by the name of Johann Ludwig Burckhardt. During his time in Syria he had visited Palmyra, Damascus and Lebanon but was intrigued with the stories of a ruined and ancient city forbidden to foreigners. Pretending to be indifferent to Petra he persuaded his guides to take him though the Wadi supposedly on route to another destination and thus in 1812 became the first European to see the city and the tombs for hundreds of years. He died in 1817 but his book – Travels in Syria (Jordan) and the Holy Land (1822) – compiled from his papers revealed the existence of Petra to the western world. Today Petra in Jordan is described a “wonder of the world” and visited by increasing numbers of tourists. Still largely undeveloped (and protected) it is possible for a visitor to reach into the sand and stones and pick up a shard of pottery or a fragment of carved sandstone. It is worth noting that it is strictly forbidden for any archeological remnants to be removed from the site. As we said earlier, the real mystery of Petra (Reqem / Sela / Rock / Jordan) is how little is known of its history and the nations that lived there. Hidden under the sands and rocks are still undiscovered tombs. As recently as 2003 a new series of rock cut tombs were discovered under the Treasury. The Hashemite Kingdom of Jordan has recognised the importance of this great archeological site and is making concerted efforts to protect and preserve it for future generations as well as making accessible to an often awestruck public.